Wednesday May 5th 1926 I did not get up till nearly noon. Had lunch and went out to see The Williams Girls. Did not get back till eight oclock. Talked to Hattie. Thursday May 6th 1926 I left Des Moines at 11.30. The Whetstones and Byington were at the station to meet me. I came up home with Hattie. Spent the evening visiting. Had letter from Ida and Lydia. Friday May 7th 1926 This is Dear Wills birthday. How I remember the last one. The girls dad a luncheon so I met some I knew. After supper I went up to Mrs Moores. Hattie came up. We came back together. Saturday May 8th 1926 I wrote Lydia and Mable MacDougall in AM. Went down town by street car. Did some errands was up in Otts office. Then went up to Clara Shultz by street car. Hattie and Cora were there and a few others. A pleasant days visit. Sunday May 9th 1926 I did not got to church. This is Hatties birthday. The Byingtons were here for the day. Rain in evening. 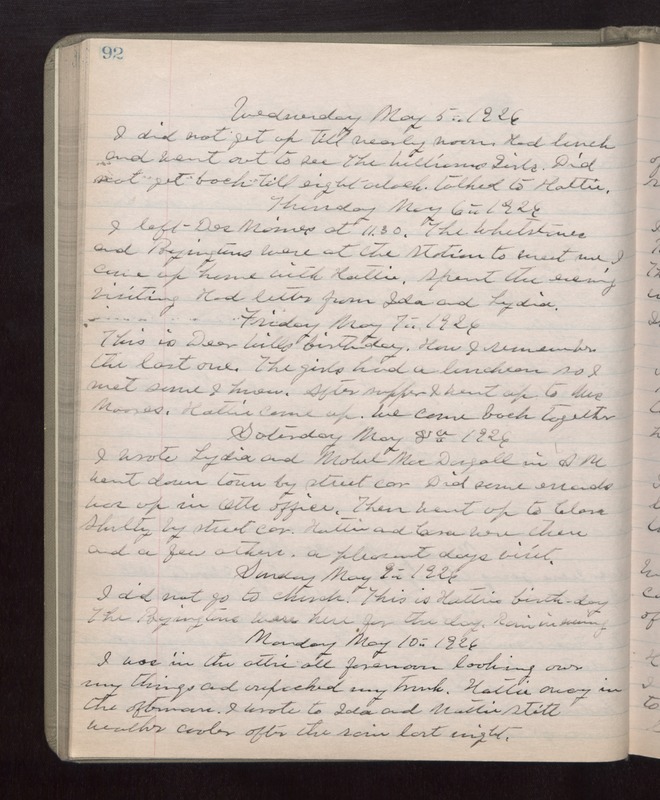 Monday May 10th 1926 I was in the attic all forenoon looking over my things and unpacked my trunk. Hattie away on the afternoon. I wrote to Ida and Mattie Stitt. weather cooler after the rain last night.